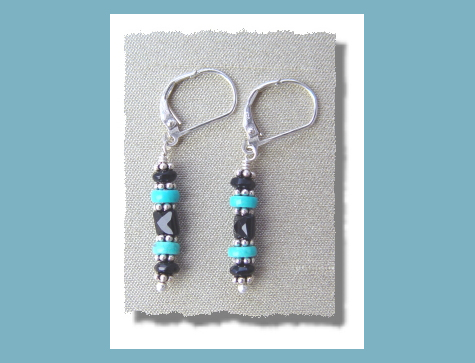 The set includes one pair of earrings. 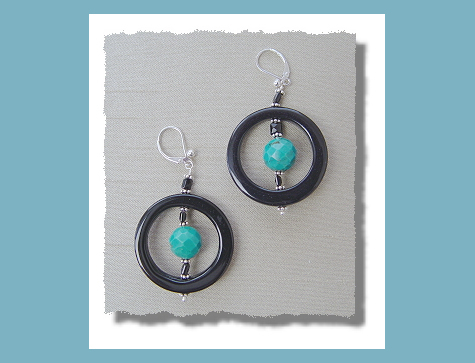 When ordering, please indicate in the comments field whether you would like the smaller turtle earrings (#1) or the larger, heavier earrings with the black onyx circles (#2). 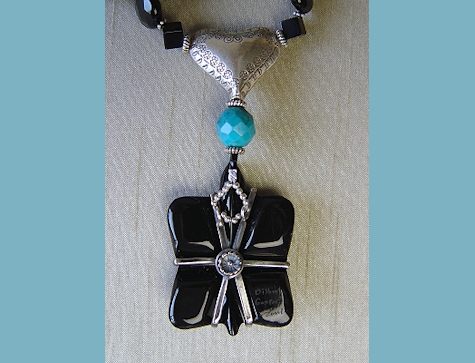 PLEASE NOTE: This is a gently worn estate piece. Sgraffito means "scratched." Normally the term is applied to designs scratched into a painted or ceramic surface to reveal different color layers. Here the artist has taken advantage of marble's chalky white appearance when scratched to make a delightful turtle shell pattern radiating from a sunface. The design contrasts beautifully with the highly polished surface. So... have the Zuni adapted an old Italian art form? Perhaps, but we also need to recall that Native Americans have been scratching designs and information in rock since they arrived here -- isn't that the definition of a petroglyph? According to McManis (see reference below), for the Zuni the turtle is associated with rain and serves as a link to the ancestors. 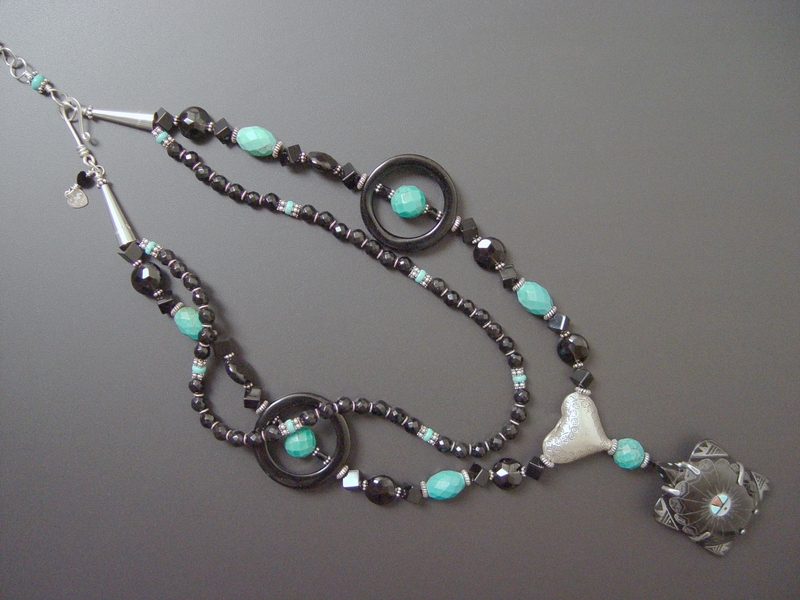 He also mentions that turtles are among the most frequently carved animals at Zuni. However Bahti mentions that turtles are not usually used as fetishes among Pueblo peoples, and it's true that turtles are not mentioned in Cushing's work on Zuni fetishes. 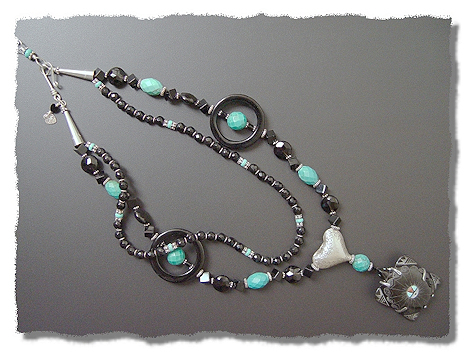 This illustrates a distinction we have made before: the authentic Zuni carvings I use in my work are made for sale. They are not ritual "fetishes" which have been blessed by a Zuni priest and intended for ceremonial use. Sams and Carson give the turtle the attribute of Mother Earth. 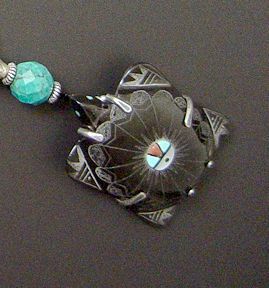 It seems very significant then that this sweet turtle has an inlaid Zuni sunface, bringing together in one the Mother and the Father. Unfortunately, as with the ubiquitous rainbird, it seems to be difficult to find a discussion about the symbol of the sunface. The Sun-father is, according to Cushing, revered as the "Holder of the Paths of Life." Prone as I am to taking off on wild tangents, I recently tried (and thus far failed) to establish whether there might be some relation between the Zuni sunface design and the tiny sunface design on the tail of the Yucatec rattlesnake (Crotalus durissus durissus) from Chichén Itzá. I had to laugh at myself remembering Castaneda's obsession with early trade routes which don Juan teased him about mercilessly. Nonetheless those trade routes could have brought influences in both directions between the Zuni and the Maya peoples and the sunface design seemed like an interesting research project, especially since it involved one of my favorite animals, the rattlesnake! Not surprisingly, the rattler with its curious marking symbolized the sun for the Mayans. The Yucatec rattlesnake was probably also associated with the sun because the serpent's rattle, which grew additional segments every year, was a perfect symbol of time. Everyone knows about the shadow rattlesnakes which slither down the steps of the Pyramid of Kukulean at Chichén Itzá on the equinoxes. This pyramid appears to have been an astronomical instrument for, among other things, measuring the precession of the equinoxes. The precision of the gigantic instruments at Chichén Itzá enabled the Mayans to measure the duration of the 25,800 year cycle which will bring the ecliptic back into perfect conjunction with the Great Rift, the cosmic womb at the center of the Milky Way on the famous end date of the Mayan calendar -- December 21, 2012. The fact that they recognized the actual center of our galaxy is remarkable. They devised a calendar which tracks a cycle of time difficult for the human mind to comprehend. I recently had the extraordinary opportunity to see a first printing of Copernicus' De revolutionibus orbium coelestium (1543) replete with hand-written redactions by a Church official! The head librarian opened the book for us to the first printed illustration of the heliocentric solar system, and I felt like I was in the presence of scientific scripture. Imagine my good fortune! The Wiki article on Copernicus calls him the "first astronomer to formulate a comprehensive heliocentric cosmology, which displaced the Earth from the center of the universe." Well, apparently not quite the first. Think about it! Copernicus' stunning achievement which arguably initiated the scientific revolution involved understanding how our tiny solar system works. Just a few years later in 1562 Bishop Diego de Landa ordered the destruction of the Mayan texts which apparently went far beyond what Copernicus had discovered to identify the very center of our galaxy which they knew held a "black sun." The Spaniards succeeded in destroying all but 4 Mayan codices (at least as far as we know). The loss to science, history and the wisdom tradition is incalculable. Fortunately they didn't manage to destroy all the carvings in stone so we are gradually piecing together something of what they knew. It should make us review any tendencies within ourselves toward dogmatism and its attendant tunnel vision shouldn't it? The Mayans also performed tremendous feats of acoustical engineering. The echoes at Chichén Itzá are world famous: when someone claps their hands, the echo that comes back from the Pyramid of Kukulean is the sound of the sacred quetzal, and the echo that comes back from the nearby pyramid with the inverted serpents is the sound of a rattlesnake rattling. Together they form the Quetzacoatl, the Plumed Serpent. I know nothing about acoustics, but I rather imagine it would tax the best modern acoustical engineer to design monumental architecture which would transform sounds in this specific way. The Mayans did not, as far as we know, have frequency analyzers or MatLab. I read one analysis of how "easy" it would be for them to notice that the echoes from their temples changed frequency based on the depth of the steps and so enable them to design shallow steps to return the quetzal call. I don't think that explains the echoes of the rattlesnake and certainly doesn't explain the transmission of sounds over long distances from the top of the temple and at the ball court. They seem to have deliberately designed wave guides. It is interesting to observe also, as at least one author has observed about the Egyptian hieroglyphs, that the incredibly painstaking investigative work of translating these lost languages is often conducted by linguists, not by people with a background in various scientific disciplines. It is quite possible that linguists would completely miss scientific information simply because they have no background in that field and perhaps because even today's scientists have no comparable knowledge. Jenkins' work (below) offers fascinating interpretations of the Maya stelae based on his astronomical understanding. To return to this dear little turtle after that extended digression (if anybody is still reading this): I hope you will take her home and let her remind you of the mysteries of Mother Earth which reflect the grace of the Sun-father and let her connect you with the wisdom of the ancestors.